Large-scale manipulation of the ground didn't, of course, begin with the Land Art movement of the 1960s and 1970s. Landscapes have been molded for purposes mostly defensive and sometimes symbolic since prehistoric times; perhaps the most familiar application being castle moats. With more peaceful times, castles devolved into country houses--a change which can be traced in increasing numbers of doors and windows and decreasing thicknesses of walls--and earthworks, no longer needed for defense, took on a gentler purpose. As soon as the ground plane began to be arranged in formal patterns, it must have been obvious that the garden was best viewed from above. Early gardens were placed where they were overlooked by the upper galleries of the house so that even if the weather did not permit strolling out into the landscape, it could still be enjoyed from while taking a turn about an upstairs room. 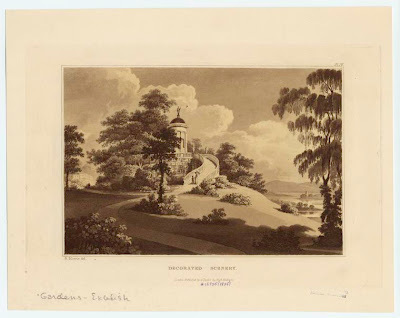 And when outside, a great pile of dirt--an artificial hill, reminiscent of fortifications past, created an elevated viewing space for overlooking the garden and was a logical use for the soil excavated from water features and sunken gardens. 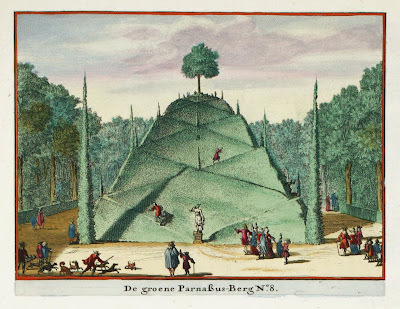 What must have begun as a simple hill gradually took on an elaborate sculpted form, as paths were carved into it for reaching the top, and decorative features were added. Eventually they would be adorned with temples, and even revolving seats for taking the 360 view...an overlook to the garden still, but also a destination in themselves. The idea of the elevated, sculpted viewing mount is still with us, most prominently in the work of Charles Jencks . Pictured below, his Garden of Cosmic Speculation, Dumfries, Scotland. Very interesting - great illustrations. Andrew Graham-Dixon was on TV this week ('The Culture Show') visiting Jenkes' garden. He noted how the forms and mounds look computer designed (like "a futuristic golf course"), but this is not necessarily a criticism for a garden inspired by ideas and science.